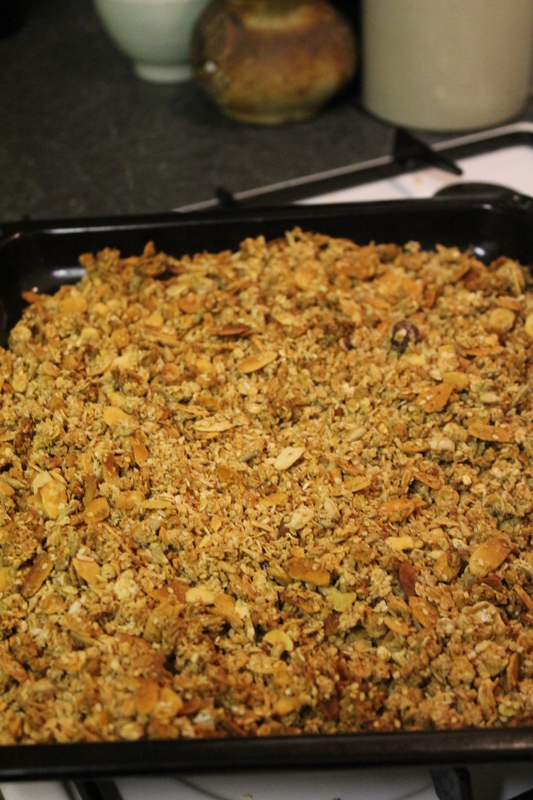 Well hello home-made granola, where have you been all my life! (and why have I never made you before)? It really couldn’t be easier. I guess out of laziness I’ve always bought packs of granola, not imagining home-made would be any better than some of the good brands out there on sale. How wrong I was. Now I have to say, I do love Dorset Cereals granola, but now I’ve discovered home-made is on another level. Not only is it healthier (you can control the sugar content) but you can add whatever you like to the recipe, if you prefer certain nuts then just add more of them. I’ve tried to introduce more seeds, nuts and dried fruit to my diet recently so my recipe had a generous addition of sesame and pumpkin seeds, almonds, hazelnuts and pecans which are my favourites. They are a great source of fibre, contain omega 3 (healthy fats) and are reputedly good for reducing inflammation and preventing the onset of type 2 diabetes. Instead of butter, sugar or golden syrup I used agave and maple syrup, plus a bit of local honey and some nut oil. What I love about this granola is that you don’t just have to eat it for breakfast. It’s true to say I usually start my day with granola. Just a handful sprinkled on Rachel’s organic vanilla yogurt with some fresh or dried fruit sets me up nicely, but I also discovered that it’s just as nice as a quick and attractive dessert requiring minimal effort. Another brilliant thing is that once you’ve made a big batch of granola it keeps for a while (probably around 4 weeks) as long as you store it in a sealed airtight tub. But if my kid is anything to go by though it wont last that long. He’s not usually a cereal fan but couldn’t get enough of this! 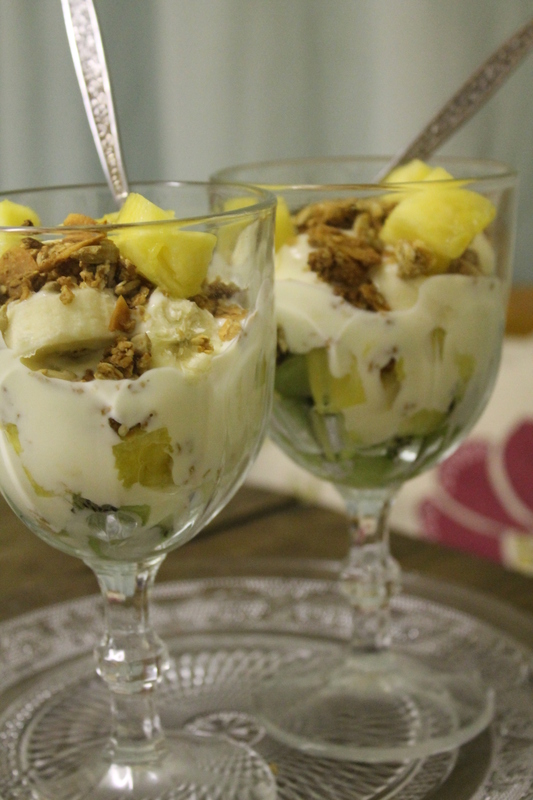 Layer chopped kiwi fruit, fresh chopped pineapple and banana, with Rachel’s organic Mango yogurt and home-made granola for a healthy tropical dessert. Preheat the oven to gas mark 2/150 degrees C.
Mix the wet ingredients (oil, syrup/honey and vanilla) in a large bowl. Add the dry ingredients (except the fruit and coconut) and mix well ensuring that it is all coated (you may have to add a little more honey or syrup if it looks too dry). Spread the mixture out fairly thinly on either one large or two smaller baking sheets. Bake for about 15 minutes before checking and giving it a bit of stir to make sure of an even bake. give it another 5 minutes then add the coconut. Bake for another 15 to 20 minutes keeping an eye on it and stirring a bit if necessary. Once it is a lovely golden brown remove from the oven and allow to cool. Break up any really big chunks and store in an airtight container.